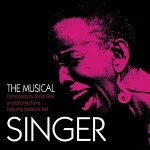 Singer, the new album written by Georgie Fame and Steve Gray, and performed by Madeline Bell, tells the life story of a female vocalist. The live concert performance, recorded in Tilburg, Holland in 2004 is available for the first time on CD. "In the autumn of 1984 composer and arranger Steve Gray and myself were involved in a concert for Dutch radio with the renowned Metropole Orchestra, with whom we had both worked individually in the past. Another member of that production was the well known Dutch entertainer Edwin Rutten. The three of us went to supper after the concert and Edwin suggested that Steve and I might compose an original work which could be performed with the Metropole Orchestra. We were flattered and a little excited by the prospect but nothing further was discussed. In January 1985 I was on one of my regular tours of Australia when Steve called me in Sydney to say that he’d heard from Holland and the project was on!. Furthermore, the proposed recording dates were March 3rd/4th and 5th. I wasn’t due back in England until mid-February but Steve said he would make a start with some ideas until I returned. We lived not that far from each other and I went over to his place as soon as I got back from Australia. Steve had prepared a handful of melodies and it was decided that the work should be about a female singer’s life story - in a nut shell. We both agreed that the subject of the story should be played/sung by one of our great friends and favourite artists, Madeline Bell. I was to be the narrator and we had barely three weeks to complete the project. Steve had the added responsibility of scoring the ten or so songs for a big band and orchestra of over 60 pieces plus a 30 piece choir, and we met constantly. I personally made many trips from the bedroom to the music room in the middle of the night pursuing ideas and lyrics. I had never been put under such pressure to meet a deadline but I am eternally grateful to Steve Gray for dragging me out of the lyricist’s closet. I had also never been involved in an artistic work of such magnitude. Things progressed well and we all met up in Hilversum with the orchestra which was conducted by our good friend the late, great Rogier Van Otterloo. I was still writing some lyrics during the actual recordings and Madeline herself helped out with one line of the song ‘My Second Home’. Drama ensued on the last day when I developed a ‘mental block’ in completing the lyrics for the final song ‘The Game of Life’ which I was also meant to sing but thanks to the patience and understanding of all concerned, I was given a little ‘extra time’. I emerged after about 20 minutes in ‘solitary confinement’ and sang the final piece to everyone’s relief (and satisfaction). We were all immensely proud to have pulled it off and the orchestra invited us back 20 years later for a repeat performance. Better still; in 2004 we were given the opportunity to present the work in a matinee concert in Tilburg, Holland where Steve Gray was present in the audience. Thanks to the Dutch Radio Authorities we are proud to be able to make the ‘live concert’ version available to the general public on CD. The whole story is told through music and song and there is not one spoken word. We sincerely hope that you enjoy sharing the emotions and experience that come with this work which we dedicate to the memory of Steve Gray."